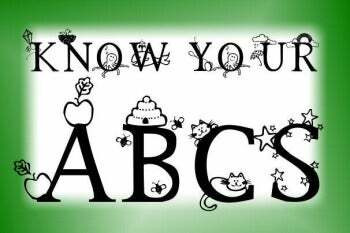 Learn your ABCs with cute Kids Alphabet from House of Lime. This TrueType font includes just upper case letters regardless of whether you type in all caps or lower case, and there's no punctuation (therefore no apostrophe in Kids Alphabet's name). Each glyph includes a picture that represents the letter. Standard beginning-sound images include an apple, cat, dog, queen, violin, and xylophone; more unusual ones are the ghost, jack-in-a-box, a rainbow, and stars. Free/donationware font Kids Alphabet illustrates each letter with a word, helping kids learn their AppleBeeCats. Each image is humorously sketched--look for the elephant being chased up the letter E by a tiny mouse--and the images fit perfectly with the letter, also a sketched-style glyph. A solid display font, Kids Alphabet needs to be quite big, at least 48 point, to see all the detail. It's also unsuitable for anything longer than a short word or two since the kerning is irregular, thanks to frogs taking flying leaps, umbrellas catching errant raindrops, and zebras running out from behind the letter. Embedding is restricted in the free/donationware version of Kids Alphabet, but the commercial version--available for a fee--includes full embedding rights; contact House of Lime for information. For personal Web use, the license requires you include a link back to House of Lime somewhere on your site. A Mac version is available as well. Note: This file is donationware. It is free for personal use, but the developer accepts and encourages donations. Commercial use requires permission from the vendor. To use this font, unzip the folder and install the .ttf file in the folder C:\Windows\Fonts. Note that the font won't appear in your applications until you close and re-open it. For more guidance see How to Install and Uninstall Fonts in Windows.